Now why would anyone need a Service Agreement when they have Samurai Appliance Repair Man? Why, it’s better than a frog in a blender… er, something like that. The drain is clogged with what we professional appliantologists call “gookus.” That’s a technical term that refers to coins, nails, bra wires… anything that ain’t supposed to be there. If it’s clear, then there could still be gookus caught in the drain pipe– a little more disassmbly involved with that job and we can help you with that in the Laundry Forum at the Samurai School of Appliantology. It’s also not unusual for these pumps to just go bad; the motor can burn out or seize up, the impeller can shear off or become so boogared up that it can’t pump the water anymore. If that’s the case with yours, come git you a new drain pump. 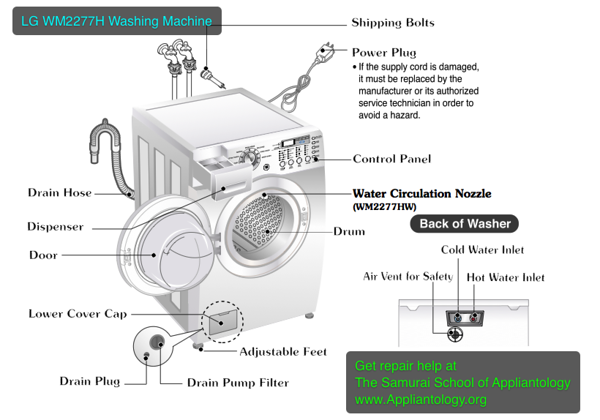 This entry was posted in Washer Repair on May 15, 2011 by Samurai Appliance Repair Man.